I'm not as rabid a fan of World of Warcraft as John Funk or Greg Tito. Nevertheless, when we had a chance to jump into the Cataclysm beta, I was first in line. 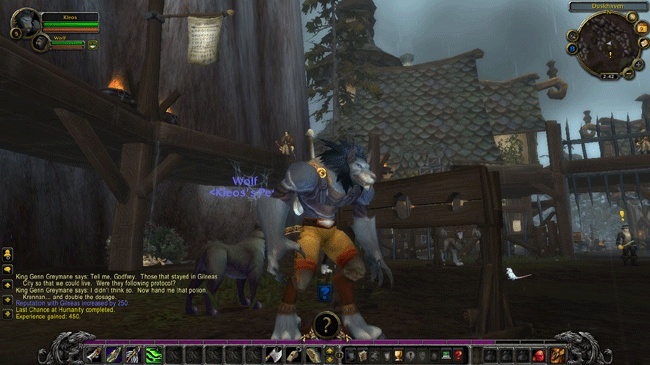 Rather than taking one of my current characters out for a spin, I opted to start a new life as a Worgen, the new werewolf race. Having read about Greg's experiences with the new Horde race, the Goblins, I was anxious to see how the new Alliance race stacked up. Bear in mind that there are some story spoilers for the first dozen levels included here. 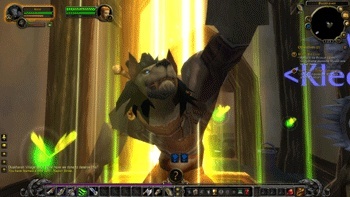 The first thing to notice about the Worgen is that you don't actually begin playing as a Worgen. You begin as a human standing in the dark and gloomy merchant square of the town of Gilneas. The city's on lockdown because of recent attacks and, if you look very closely at the city's skyline, you can see werewolves bounding from rooftop to rooftop. Finding a nearby lieutenant clawed to death, you begin to salvage supplies and help evacuate the city. Along the way, you'll encounter your first Worgen as they come down to attack the soldiers of the town. It's a very atmospheric sequence and not just because everything is brown and grey. The artists and level designers have created a space that feels threatening, even if the content is dead easy. Nevertheless, it sets the mood nicely. In typical WOW fashion, your area of operations begins to enlarge, moving from this opening city street to the other districts of the city and bringing you from running errands for the captain of the guards to working directly for the king himself. Thankfully, this is when the story actually starts to get a bit interesting. The king needs the help of a former ally who has been accused of treason and is now wasting away in the dungeon. You'll want to earn his cooperation once you rescue him because he knows about a secret arsenal you can use against the Worgen. He'd been planning to use it against the king, but the Worgen have caused him to join forces with his former enemy. It's not War and Peace, but it works to give a nice bit of story for you to hang all the action on. That's particularly important because the content up to this point is still fairly traditional -- find five letters, kill eight monsters, make ten sandwiches. Having read over the experiences that others were having with the Goblins, I was feeling a little let down.